Today as we gathered together to share goodies and the joy of your children, what I knew all along was beautifully expressed with your outpouring of love to me. God not only blessed me with your treasures, but with each one of you. You are the heart of our school, and I thank God for the honor of knowing you, loving you, and I thank you for allowing me to be surrounded by your precious children. I love them all, and I love you all very much. You will always have a special place in my heart and my thoughts. God bless you and your beautiful, sweet, and joyful children. 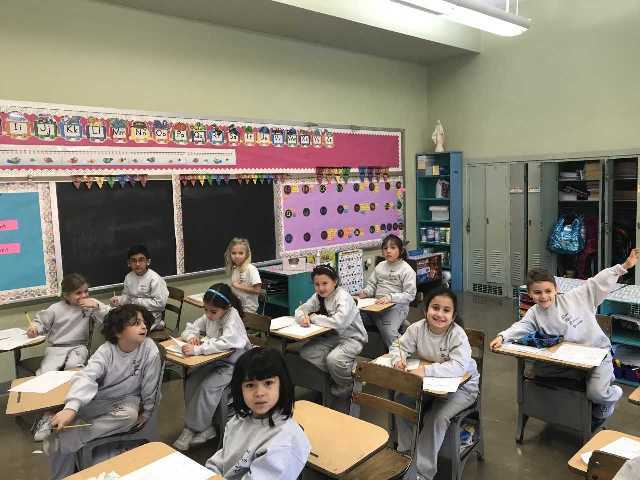 This is not a goodbye, as you know I cannot be away from our beloved St. Mel and the “little” treasures and gifts that make our St. Mel a special place. It has been my absolute joy to have been your teacher for the last few months. You are all so very special to me, and I love each of you so very very much. You will always be in my heart and prayers.Remember, as we always would say “there’s is always room for hugs”. So my sweet precious little ones, I send you my love and hugs every day. There is no homework for today! Have fun and enjoy yourselves with your wonderful parents. I will see you tomorrow my Phenomenal Nineteens!! Friendly Reminder: Tomorrow is a Dress Down Day and 11:50 Dismissal. I am so happy to wish you and your family a Bright and Joyful New Year! May 2019 be filled with happiness, peace, and love for you and your phenomenal children. My prayers and thoughts were with you during Christmas. I hope you and your family had a Most Blessed Christmas. Homework: Math: I gave the children a Math Worksheet on Subtraction. Spelling: I gave the children their new Spelling words which they attached into their Spelling notebook. These words are related to the new story, “A Fox and a Kit” which the children will be reading. In class, the children wrote each of the words (including the Bonus Words) three times each. There will be a Spelling Test on these words next Wednesday, January, 9, 2019. Homework: The children will alphabetize each of the words (including the Bonus Words). The children put their Spelling notebooks into their backpacks. Both assignments are due tomorrow, Thursday, January 3, 2019. Friendly Reminder: Tomorrow, the children will have Gym. Friday, January 4, 2019 is a half day. I hope you don’t mind that I gave your child a Pete the Cat backpack clip- on figure, and a Pete the Cat bookmark. The children are so very sweet, loving and phenomenal, and we love Pete the Cat books that I thought it would be a cute idea for each of them to have the very Cool Pete the Cat. Today, we listened to some of our classmates read about the adventures of Pete the Cat! We had a GREAT day as always!!! It has been a Blessing to have had the honor and joy to have taught your beautiful, kind, loving, and phenomenal children. God has blessed me with the gift of each of your beautiful, joyful, wonderful children. I will treasure these months spent with them and you, their loving, kind and most supportive parents. Thank you for welcoming me, and for allowing me to be a part of your children’s lives. I will remember these precious days always. I have become a better person being with them each day, and for knowing you all. Wishing you God’s Blessings always. I will keep you in my thoughts and prayers each day. Merry Merry Christmas and May your New Year be filled with peace, joy, and happiness. “Joyful, Joyful, We Adore Thee”- My heart is filled with joy and love. Thank you for entrusting your sweet, loving, precious, children into my care. My heart is filled with happiness. Each day spent with them is a gift from God. I always look forward to being with them and seeing you. May the Grace of Our Lord fill your hearts and homes with love, peace, and joy during this Blessed Season and into the New Year. Your children took the Religion Test and felt confident. We had a wonderful day. I did not assign homework today. Wishing you and your beautiful children a wonderful evening. Friendly Reminder: Tomorrow, Friday, December 21, 2018 dismissal is 11:50. It is a Dress Down Day. We will also have a Prayer Service. I apologize for my later posting yesterday. Homework: I gave a Math worksheet on the concept of Subtraction. This assignment is due tomorrow, December, 20, 2018. It was wonderful seeing so many of you today at the Christmas Concert. Weren’t our children absolutely phenomenal in their awesome performance? Seeing their beautiful faces and hearing their joyous voices certainly inspires us as we prepare for the birth of Our Lord. I joyfully want to wish you, and your beautiful families a Most Blessed Christmas filled with the peace of our Dear Lord. May the New Year be filled with joy, peace and love for you and your kind, loving, joyous children. Each day I am with them, I know how truly blessed I am to be surrounded by their warm smiling faces and kind hearts. They truly are special gifts and I thank God for them. Friendly Reminder: The Religion Test on Advent will be given tomorrow, Thursday, December 20, 2018. Wishing you and your delightful children a wonderful evening. Kindly initial pp 7-21 in the Phonics Workbook. We did the pages and I corrected the pages. For Homework I assigned pp22-24 in the Phonics Workbook. Also, I gave pp.102-103 in the Math Workbook. Both assignments are due tomorrow. Friendly Reminder:Religion Test will be given this Thursday December 20,2018. Looking forward to seeing you tomorrow at our spectacular Christmas Concert at 8:30. All the children are to wear Christmas colors/theme. I hope you had a wonderful weekend. As we continue to enjoy this beautiful season of Advent, I hope you are filled with joy and happiness. Homework: Math Workbook: pp. 100-101. I did not assign page 99 as we will do it together in class tomorrow. ***PLEASE NOTE: I have rescheduled the Religion Test (notes on Advent) to this Thursday, December 20, 2018. I am so looking forward to seeing you this Wednesday for our spectacular Christmas Concert. We had practice today, and the childen sang beautifully! It will certainly be a joyous event. Although the weather is dreary, our class is warm and joyful. Wishing you a Most Blessed evening. As the beauty of the Advent Season continues to embrace us, may your weekend be filled with the gifts of peace, love and joy. I especially love this season for it allows us to reflect, rejoice and continue to await the Birth of Our Lord, Jesus Christ. It is my hope that you and your special gifts- your darling wonderful, phenomenal children are filled with our Lord’s gentle love and His Blessings. Friendly Reminder: This Wednesday, December 19, 2018, the children will joyously celebrate this year’s Christmas Concert. You are joyfully invited to this wondrous celebration! The Concert begins at 8:30. The children are to dress up in Christmas colors/ theme. I am sooo looking forward to seeing you on Wednesday. Also a Gentle Reminder: The Religion Test on the Advent notes will be given on Wednesday, December 19, 2018. Thank you for continuing to study for the Religion test which will be given next Wednesday, December 19, 2018. On a such a blustery day, I hope you get to enjoy a cup of hot cocoa!! My heart is joyful because of you and your phenomenal, delightful, loving children. I am truly blessed. Writing- I gave the children a writing activity entitled, ” Christmas Time”. The children will write about Christmas traditions they and their families enjoy. The Math homework and writing activity sheet are both due tomorrow, Thursday, December 13, 2018.
will be a Religion Test on these notes next Wednesday, December 19, 2018. I will read the test aloud to the children. The test’s format will consist of both Multiple-Choice and Fill-in. For the Fill- in portion of the test, there will be a Word Box to assist the children in completing each statement. I hope these notes will be beneficial to you and your child. I will also review the notes with the children during the week. 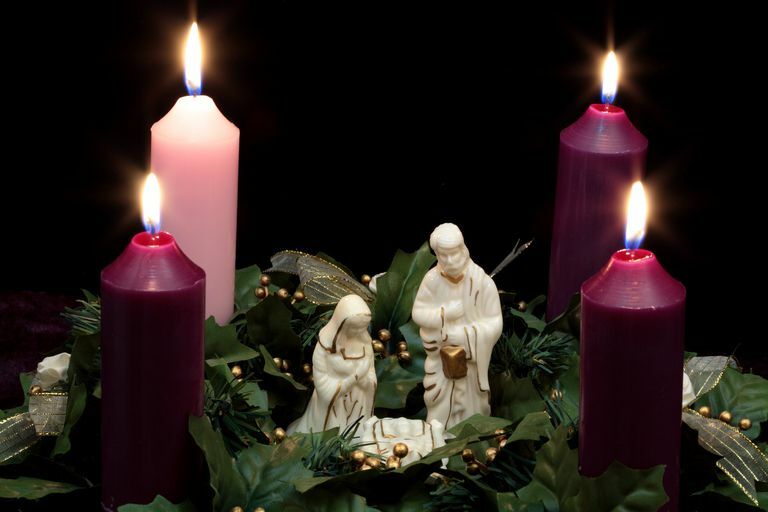 During this second week of Advent, may you and your phenomenal children be filled with joy and peace. Final /t/ t and /b/ b”. Homework: Math- I gave the children a worksheet entitled, Christmas subtraction”. Both of these assignments are due tomorrow, Wednesday, December 12, 2018. Kindly Note: Tomorrow, Wednesday, December 12, 2018, I will give the children a Math Test on the concept of Subtraction. The children will be permitted to use counters in order to complete the sheet. 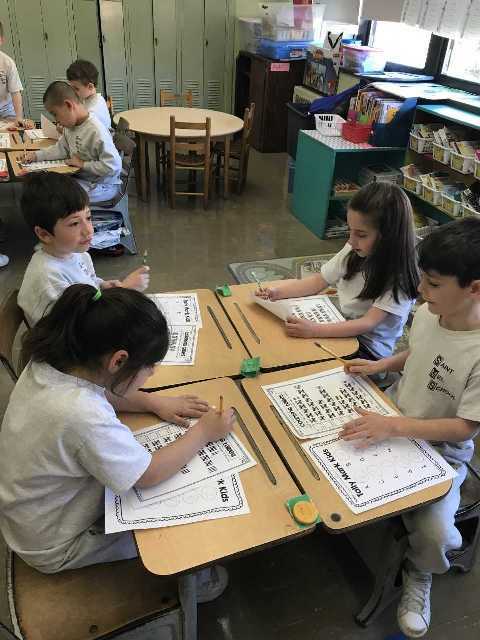 We have been practicing our subtraction skills in class through classwork and homework using our Math Workbook as well as individual Math sheets. The students are mastering this skill quite nicely. In class today, we began a writing activity entiltled, “I Saw One of Santa’s Reindeers”! We will continue this writing activity in which the children will explain what his/her reindeer did first, then did next, and finally what the reindeer did. We are in the first draft stage of this activity. After the children complete their first draft in which they write their ideas, I will sit with them and assist them with any editing and/or spelling they require. 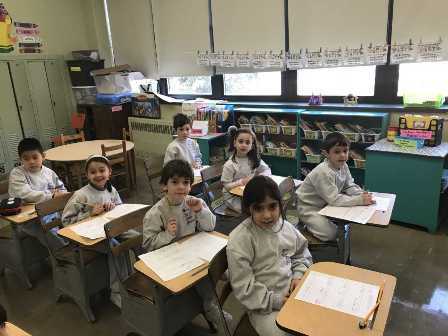 The Writing Process has many steps and this one in particular allows them to enjoy using their wonderful imaginations as well as use their knowledge of capitalization and punctuation rules which they have become very comfortable and proficient with in their writing. I hope you and your loved ones are enjoying this Blessed Season of Advent as we joyously wait for the birth of Our Lord Jesus Christ. Homework: Phonics Workbook pp. 11-13. On Friday, new Phonics Workbooks were given to the children. On Friday, we did pp. 7-9. When you have the opportunity, will you kindly cover your child’s book with clear contact paper. Thank you for all your continued support and encouragement. Homework: Math- I gave the children a worksheet entitled,” Addition and Subtraction Practice Sheet”. Both assignments are due tomorrow, Tuesday, December 11, 2018. FRIENDLY REMINDER: Spelling Test will be given tomorrow, December 11, 2018. We went over the words today. We alphabetized all the words as practice. Wishing you and your sweet loving children a beautiful evening. Kindly Note: I have rescheduled the Spelling Test originally planned for tomorrow to be given NEXT Tuesday, December 11, 2018. I did not assign any written homework for today. Some of the children will complete their coloring of the Saint Nicholas sheet which we did in class today. We spoke about Saint Nicholas today. In class, the children finished writing their beautiful narratives of their special angel visiting Bethlehem. I know you will enjoy reading them when you visit today. Happy Saint Nicholas Day! I hope you and your loving children enjoy the day, and perhaps have a special treat from St. Nick! Homework: I assigned pages 89-90 in the Math Workbook. This assignment is due tomorrow, Thursday, December 6. 2018. In class, we discussed the significance and symbolism of Advent. The children worked on their Advent Wreaths. Today, I sent home a lovely Advent activity sheet which I think you will enjoy doing with your child. The children and I discussed the importance and beauty of each Advent candle including the Christ Candle. Please accept this lovely sheet given to me by Miss Julie, one of our Faith Formation teachers, and enjoy it as part of your celebration of the beauty of this Advent Season. Wishing you and your beautiful children a Blessed evening. Homework: Math: I gave the children a worksheet entitled,”Subtraction Word Problems”. As the directions indicate, the children are to show their work on the sheet. Writing: I gave the children a creative writing activity entitled,”Let me tell you about my pet reindeer!” I am excited to read your child’s fun and imaginative pet reindeer writing prompt. Enjoy your child’s imagination with this exciting and joyful writing activity. Enjoy your evening with your delightful children. I think this is a hot chocolate night! Yummy!! Homework: Spelling Words- This week’s Spelling Words are connected to the Season of Advent. Please have your child write each of the words 3 times each. In addition, kindly have your child alphabetize the words. Spelling Test for these words (including 2 of the Bonus Words) will be given this Friday, December 7, 2018. May the Beauty of this Advent Season bring you all the Hope, Peace, Joy, and Love you and your families so richly deserve. Homework: I gave the children an ELA Worksheet entitled, ” Punctuation Match-Up”. This assignment is due tomorrow, Friday, November 30, 2018. Today, the children read a starter sentence-When I got home from school yesterday I …. The children then began writing their responses. We will continue with this writing prompt tomorrow. I hope you and your wonderful children have a Joyful evening. Homework: I assigned two pages in the Math Workbook-pp. 85-86. This homework assignment is due tomorrow, Thursday, November 29, 2018. Today, the children wrote sentences using 5 of their Spelling Words from the story, “The Big Blue Ox”. They also wrote either their favorite character or favorite part of the story, “The Big Blue Ox”. I am looking forward to reading their wonderful creative writing activities. May you and your children have a Most Blessed evening. Homework: 1) Phonics: I gave the cildren a worksheet on the letter “x”. The worksheet is entitled, “Final X Review”. 2) Math: Math Workbook: pp. 83-84. These two homework assignments are due tomorrow, Wednesday, November 28, 2018. Although the weather has turned considerably colder, your beautiful loving children continue to warm my heart. May the Grace of Our Lord continue to Bless you and your phenomenal children. I hope you had a blessed Thanksgiving with your beautiful families! Homework: I gave the children 3 worksheets to be done for homework today: 1) Religion Worksheet entitled, ” God Created, People Created” 2) Science Worksheet entitled, “Thanksgiving Food:Learning Food Group” 3) Math Worksheet entitled, ” Thanksgiving Subtraction #1″. The three activities are due tomorrow, Wednesday, November 21, 2018. Friendly Reminder: Tomorrow, November 21, 2018 there will be a Prayer Service and Dismissal is at 12:00. May you be Blessed at Thanksgiving, and may you and your families enjoy this joyous celebration. Reading Worksheet and Thanksgiving Worksheet. Both worksheets are due tomorrow, Tuesday, November 20, 2018. As we approach the joyous celebration of Thanksgiving, I wish to express to you how very thankful I am for the gift of your loving children, and I am grateful for you. I am very very blessed. Please Note: Spelling Test will be given tomorrow (including two bonus words). Homework: Spelling: I gave the children another worksheet connected to the Spellings Words which the children have been studying for the Spelling Test that will be given this Friday, November 16, 2018. The children will practice writing each of the words on this worksheet. Science: I gave children a worksheet in which they circle items/elements a plant needs in order to survive. They will also write a sentence describing which item/element they feel a plant needs in order to blossom and survive. Please Note: I know you will be delighted when you read the beautiful prayer and sentiments which your children created for you and family members. As I stated yesterday, you will enjoy the heart-warming and joyful prayer which the children created. May the blessings of your loving children fill your hearts. Enjoy your evening. God Bless You. Homework: Spelling: I gave the children a Spelling worksheet entitled, “Words with Short “o” Sound. The words contained in this worksheet are the ten words which the children will study for this week’s Spelling Test which will be given this Friday, November 16, 2018. (Please Note: the test will also contain two of the Bonus Words for Extra Credit). Math: I gave the children a worksheet entitled, “Too Much Food”. This homework assignment is based on the concept of Subtraction. Please Note: Both worksheets are due tomorrow, Wednesday, November 14, 2018. In your child’s folder, you will also find two letters from Miss Paula. These letters concern our beautiful Nativity Play. I wish to share with you a very beautiful experience that I had the joy of sharing with your loving children. Last week, we discussed writing an original prayer to Our Dear Lord. Well today, the children created a most beautiful and loving prayer on their very own. This was an exceptionally inspiring celebration of your sweet children, and their joyful sharing of thoughts and love to Jesus. Tomorrow, I will print their prayer for you to see and pray with them. I am typing the prayer for them (they already copied their words into their Writing Journal). I cannot wait to share this joyous prayer with you! Enjoy your evening with your truly loving children. Today, I gave the children their new Spelling Words based on the story, “The Big Blue Ox” which we will begin reading. The children attached the sheet into their Spelling notebooks. 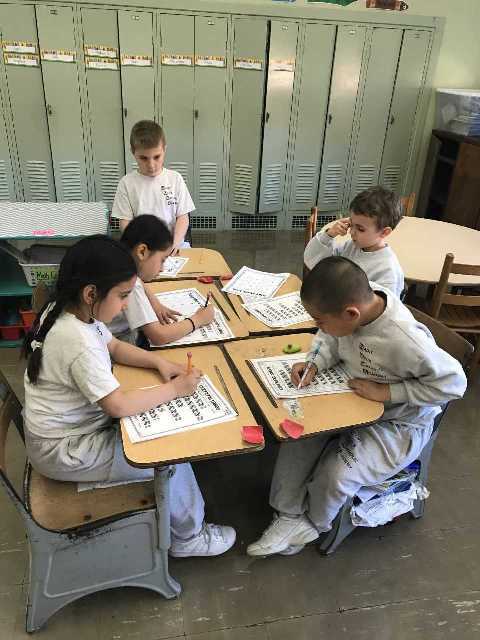 As classwork, the children wrote each of the words 3 times each and alphabetized the Spelling words (including the 5 Bonus Words). The children will bring home their Spelling notebooks on Tuesday to begin studying for the Spelling Test which will be given on Friday, November 16, 2018. I hope you and your wonderful, loving children have a fun-filled four-day weekend! Read with your child for 20 minutes. Enjoy your evening with your precious families! Don’t forget there is school is closed Friday, November 9th. It is a Professional Day for the teachers. Also, Monday, November 12th is Veterans Day. School is closed. With the day being so long, I thought if you wish your child may bring a small snack to satisfy them before lunch. The children will enjoy this little snack while we continue working on our various activities and skills. This decision is entirely up to you. We had our Religion today, and as I stated I read the test aloud. I gave out the new Math Workbook-Chapter 2. We began discussing the concept of Subtraction. Your children are excited, and as they told me-they learned all about subtraction in Kindergarten. Your children are simply Phenomenal!! Homework: Math Workbook p. 66. This assignment is due tomorrow, Wednesday, November 7, 2018. May you and your loving children enjoy the evening. I did not give any written homework today so the children will have ample time to study/review their notes for tomorrow’s Religion Test. They have their Religion notebooks in their backpacks. As I mentioned in my notes, the test’s format will consist of: Multiple Choice, Yes/No statements, and Fill-in statements. I will provide a Word Box for the Fill-in portion of the test. There will also be a Bonus Question. As I also stated, I will read the test aloud to the children. Today, we took part of Part II of the Math Test. The children required additional time to complete the first few examples. We will complete the rest of the Math Test tomorrow. May you and your sweet children have a lovely evening. PLEASE NOTE: I decided to reschedule the Math Test Part II to Monday, November 5, 2018 since I had a number of children absent today. Also, The Religion Test scheduled for Monday, November 5, 2018 has been rescheduled to Tuesday, November 6, 2018. In your child’s folder, you will find an additional Progress Report Confirmation Form complete with your child’s subject grades. Kindly sign the form and return it with your child. Thank you. May your weekend be a happy and joyous one for you and your child filled with laughter. As always, I am blessed to share these wonderful days with your loving and Phenomenal childen. Reading Homework: Today we read the packet that is in your child’s folder. I know you will enjoy reading this story with your child. Please have your child complete the two attached worksheets. This assignment is due tomorrow, Friday, November 2nd. Math: Second part of math test will be given tomorrow, Friday, November 2nd. Have FUN as you enjoy this WONDERFUL Halloween with your sweet, precious children. There is no written homework today. Your assignment is to enjoy the day! The children are well prepared for their first part of the Math test which will be given tomorrow. Homework: Math: In your child’s folder, you will find three attached Math sheets. All sheets are due tomorrow, Wednesday, October 31, 2018. I know your child will have a “Spooky” good time completing these homework sheets. Please Note: In your child’s folder, you will also find a Progress Report Form. Kindly, complete the form and return it by Monday, November 5, 2018. Thank you, and I wish you and your sweet loving children a beautiful evening. Homework: Math Workbook pp. 57-58. Please Note: I will give the children a Math Test on Addition Concepts over two days: Thursday, November 1, 2018 and Friday, November 2, 2018. Please Note, Today, I gave the children Religion Notes which I typed. I attached the notes into their Religion notebook. I will give the children a Religion Test on these notes Monday, November 5, 2018. I will read the test aloud to the children. I hope you find these notes beneficial while studying with your child. And indeed, it was a joyous day! It’s always wonderful to see you in the morning as we join in prayer as the faithful community of St. Mel. Today our school continued to show the love and happiness that permeates daily. I am honored and always blessed to see you and your beautiful and loving children, but today I felt extra special to have you celebrate my birthday. I will always remember this day filled with smiles, laughter, and love. I wish you and your Phenomenal children a WONDERFUL and BLESSED weekend. Writing: I gave the children a Creative Writing activity sheet. The children will complete seven sentences connected to Halloween. I know you and your sweet children will have a “Spooktacular Fun Time” with this writing activity. Both assignments are due tomorrow, Friday, October 25, 2018. 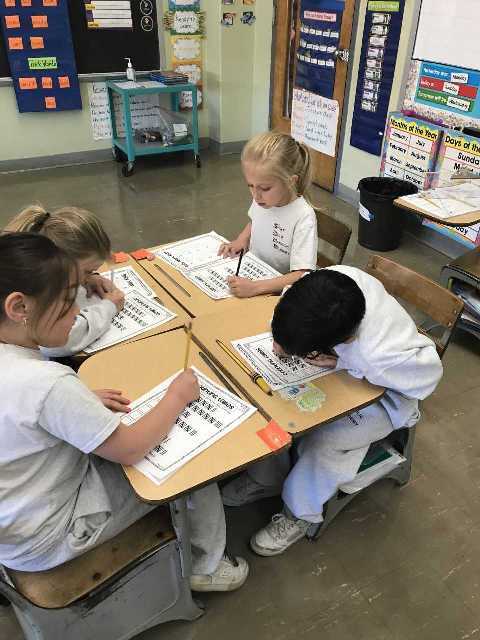 Writing: I gave the children a worksheet entitled, “Using Sight Words”. The children are to write four sentences using one of the four sight words (after, walk, from, by) in each sentence. These two assignments are due tomorrow, Wednesday, October 24, 2018. Friendly Reminder: The children have Gym on Thursday. Wishing you and your sweet, loving children God’s Blessings. May you have a wonderful evening. Homework: Math Workbook p. 44. This assignment is due tomorrow, Tuesday, October 23, 2018. Each day with your beautiful phenomenal children is a gift. Spelling Test will be given tomorrow, Friday, October 19, 2018. A second Math Test will be given tomorrow, Friday, October 19, 2018 on Addition. The children felt confident while taking today’s Math Test. Homework: Math Workbook p. 42. This assignment is due tomorrow, Friday, October 19, 2018. I wish you and your PHENOMENAL children a joyous evening. The children has been studying and working conscientiously on Adding single-digit numbers and modeling word problems. Today, we learned the value of using zeros in addition. Thursday, October 18, 2018 and Friday, October 19, 2018, the children will be given Math tests on the concept of addition. Today, we did two worksheets in which the children identified Ending Blends with Consonants. They were very engaged while learning this new concept. Homework: Math: Math Workbook p. 40. Both the Math and Phonics Homework is due tomorrow, Thursday, October 18, 2018. FRIENDLY REMINDER: Spelling Test will be given on Friday, October 19, 2018. Wishing you a Blessed evening with your beautiful families. PLEASE NOTE: CLASS PICTURES will be taken tomorrow, Wednesday, October 17, 2018. The children must be in their winter uniforms. HOMEWORK: Math: Math Workbook p 36. Spelling: Please have your child alphabetize the ten Spelling Words. Both assignments are due tomorrow, Wednesday, October 17, 2018. Thank you for reading with your child nightly. I know how special this time is for you and your sweet child. I hope you have a wonderful and most Blessed evening. PLEASE NOTE: INDIVIDUAL PICTURES will be taken tomorrow, Tuesday, October 16, 2018. The children do not have to wear their uniforms. GROUP PICTURES will be taken on Wednesday, October 17, 2018. The children must be in their uniforms for the taking of this picture. Spelling Words: Today, I gave the children their new list of Spelling Words. These words are from the new story, “Pig in a Wig” which we will be reading later on. In class, the children wrote each word three times each. As part of their daily homework, I thank you for studying the words with your child. There will be a test on these words (including two of the five Bonus Words) this FRIDAY, OCTOBER 19, 2018. Phonics: In class today, we learned about Beginning Blends with the correct consonant. We did two worksheets together. The children did beautifully on this concept. Math Homework: pp. 31-32 in the Math Workbook. This assignment is due tomorrow. Please Note: Each of the children’s drawings of how they can serve God are unique and beautifully expressed. This was a most inspirational activity, and I loved reading their loving expressions of faith, and I enjoyed their warm and joyful drawings. Thank you so much for joining with your child in watching his/her moving creation. I have posted their Religion grade for this activity. Even though it was done as a homework assignment, the category comes up as classwork. The percentage is 40%. The Phenomenal First Graders once again did an awesome job! Friendly Reminder: Tomorrow is a Dress Down Day. Wishing you all a most Blessed evening. Math Homework: pp. 29-30 in the Math Workbook. This assignment is due tomorrow, Thursday, October 11, 2018. Friendly Reminder: The children have Gym Class tomorrow. Friday is a half day. The children will be dismissed at 11:55. Thank you. I hope you enjoy your evening. Math Homework p. 27. This assignment is due tomorrow. Friendly Reminder: If you have not done so, will you kindly have your child bring in his/her Faith Formation Religion Project. As you know, this activity is due tomorrow Wednesday, October 10, 2018. In addition to this project being submitted to the Faith Formation Office, your child will receive a Religion grade. I am looking forward to seeing you and your wonderful child at Sunday’s Family Mass for our Phenomenal First Grade Students at 10:30. Friendly Reminder: The children has Gym Class on Thursday. Friendly Reminder: Friday is a half day-11:55 dismissal. Math Homework: Please have your child complete p.26 in his/her Math Workbook. This assignment is due tomorrow. ELA: I gave the children a worksheet on Sentences. The children are to identify which group of words is a sentence. We did the first two examples together. This assignment is due tomorrow. Spelling Test will be given tomorrow. Friendly Reminder: The Faith Formation activity which I gave you Tuesday is due next Wednesday, October 10, 2018. As I stated, the children will receive a grade for this project in Religion. I wish to thank those of you who returned their child’s activity sheet. Tomorrow, the children attend 9:00 Mass. Math Homework: Please have your child complete p. 24 in his/her Math Workbook. This assignment is due tomorrow. Today, the children wrote their original stories which are related to their original drawings which were created earlier. Each child’s drawing and story is quite unique, and their ideas are amazing and quite interesting. We will continue this activity tomorrow. Gentle Reminder: The children have Gym tomorrow. Spelling Test this Friday, October 5, 2018. Math Homework: In the Math Workbook, please have your child do p. 22. This assignment is due tomorrow. Reading Homework: I gave the children a sheet in which they will use words connected to the story, “Sam, Come Back!’ This assignment is due tomorrow. I read the story, “Sam, Come Back!” to the children in class . We will continue to reread and discuss this story. Friendly Reminder: The Spelling Test on the words which I gave the children yesterday will be given this Friday, October 5, 2018. Information from our Faith Formation Program: On Sunday, October 14, 2018 the First Grade will participate in our Family Mass at 10:30. In your child’s folder, you will find a letter and an activity sheet. This beautiful assignment which you and your child will compose together is due by Wednesday, October 10, 2018. I provided you will two sheets of manila paper which you can use one to complete this activity. If you will kindly return the finished assignment in your child’s folder, I will greatly appreciate it. The children will receive a grade in Religion on this inspirational project. Wish you a Blessed day. Spelling: I gave the children a new Spelling List today. These are some Sight Words which they learned in Kindergarten. This a great review for the children. In class, we wrote each word three times each. Spelling Homework: The children are to alphabetize the 10 Spelling Words. They do not have to include the Bonus Words. Please Note: There will be a Spelling Test on the ten Spelling Words this Friday, October 5, 2018. I will choose two of the Bonus Words to include as extra credit for the Spelling Test. Kindly study these words with your child daily. Math Homework: I assigned p. 18 in the Math Workbook. This homework is due tomorrow. I gave the children a new Reading Log sheet today. Thank you for reading with your child daily. Reading Together is Such a Joyous Time. Friendly Reminder: The children have Gym Class every Thursday. Friendly Reminder: Spelling Test tomorrow Friday, September 28, 2018. The children will be tested on the ten “Spelling Words” and two of the six “Reading Words” will be given as Bonus Words. We practiced our Spelling words in classs today. The boys and girls feel confident and are ready to take their very First Spelling Test! We are so excited! Thank you for reviewing the words with your child during the week. Vocabulary: I gave the children a worksheet entitled “Target Words”. This assignment is due tomorrow Friday, September 28, 2018. 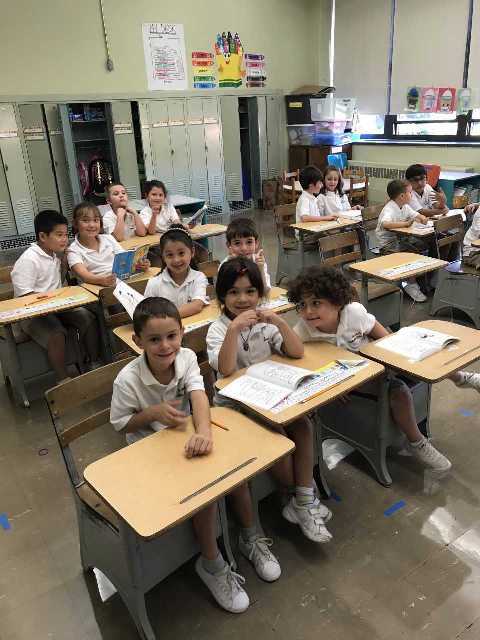 Math: Today, the children completed the first worksheet in Math which will be combined with the second worksheet to be given tomorrow Thursday, September 28, 2018. I will put the two worksheets together and grade as one mark. Thank you. I wish you all a wonderful evening. God Bless. Math: Workbook pp. 14 and 15. This assignment is due tomorrow Thursday, September 27, 2018. Reminder: I will give the children a Math sheet tomorrow, Thursday, September 27, 2018. This will be graded. On Friday, September 28, 2018, they will receive another Math sheet. I will put the two Math sheets together and grade as one mark. Vocabulary: I gave the children a worksheet entitled “Target Words”. This assignment is due tomorrow Thursday, September 27, 2018. Reading Log: Thank you for continuing to read with your child. Math: I gave the children a Math worksheet.Kindly have the children complete the sheet and return it tomorrow. We did a Math worksheet yesterday. I did not grade it, but I did make corrections to the sheet. Kindly sign this sheet and return it in your child’s folder tomorrow. I am giving the children two Math worksheets in the later part of the week. I will give them one on Thursday, September 27, 2018 and the other one on Friday, September 28, 2018. I will combine the two sheets and grade them as one mark in Math. This will become their first graded Math activity. I gave the children their Math workbooks today, and we began Chapter 1. We will use the new workbook in Math for our lessons. Spelling Words: Kindly have your child alphabetize the ten Spelling Words which they wrote three times yesterday. This assignment is due tomorrow. Reading Log:Thank you for continuing to read with your child nightly. Reading together is such a joyful time. School Picture Information: You will find in your child’s folder a flyer and envelope for school pictures. 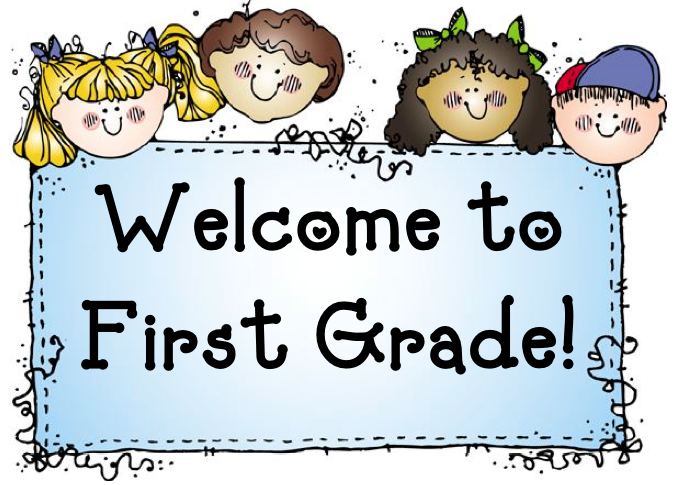 On Tuesday, October 16, 2018 the First Grade is scheduled to take Individual Pictures. They will take their Group Picture on Wednesday, October 17, 2018. Your children are simply Phenomental! They are joyful, eager to learn, and blessings from Our Lord. Please have them write the Spelling Words three times each in their ELA notebook.There will be a Spelling test on the ten words this Friday, September 28, 2018. Two of the Reading words will be chosen as Bonus Words. Kindly study all the words daily for Friday’s test. I gave the children a new Reading Log Sheet. Please complete today’s section. Thank you. ELA: I gave the children two worksheets in which they are to write words, fill-in the sentence with one of the words, and then the children will create their own sentences. Reading Log: Thank you for continuing to read with your child and filling out today’s section. Reading Log: Thank you for continuing to read with your child and filling in today’s section. Math: finish worksheet which we began in class. The children are to complete #s 11-21. Thank you for beginning the Reading Log with your child yesterday. Kindly continue reading with your child and complete today’s section. Reading Log- I gave the children their reading logs for the week. Please complete for Monday and return tomorrow. Thank you for reading with your child at least 15 minutes a day. See “Class News” tab for other important reminders!! To place your Scholastic book order online, click here. Our class activation code is LB8X9. Today, your children received the first workbook of the school year. You will find the ELA workbook in your child’s backpack. Will you kindly cover the workbook with clear contact paper which can be found at Raindew. Kindly return the ELA notebook with your child on Monday, September 10, 2018. Your children wrote this information down in the notebook which they will be using for homework. They did a wonderful job copying the information from the blackboard. Next week they will be receiving additional workbooks. Please cover them and return them the next day as we will begin to use them. Thank you for entrusting your precious children into my care. They are so joyful and sweet. I feel blessed that I have this opportunity to be with them. It was wondering meeting you during these three days. First grade has been busy learning about how to make graphs and charts in math to show information. They have been working with tally marks with their classmates to show information about a topic. In ELA first graders have been writing their opinions about their favorite seasons and giving reasons to support their opinion. We have also begun to talk about the different sacraments in Religion. 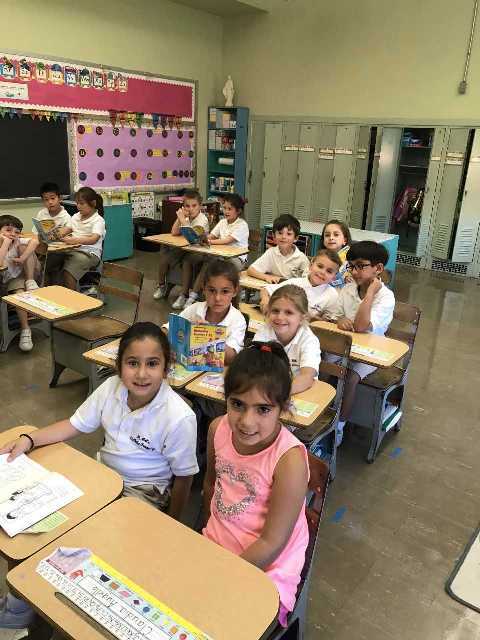 First graders continue to work hard in Science and Social Studies by learning about weather, the water cycle and how to earn and save money. First grade has been hard at work in writing. They have been practicing writing informational pieces in which they tell their readers facts or how to do something in real life. 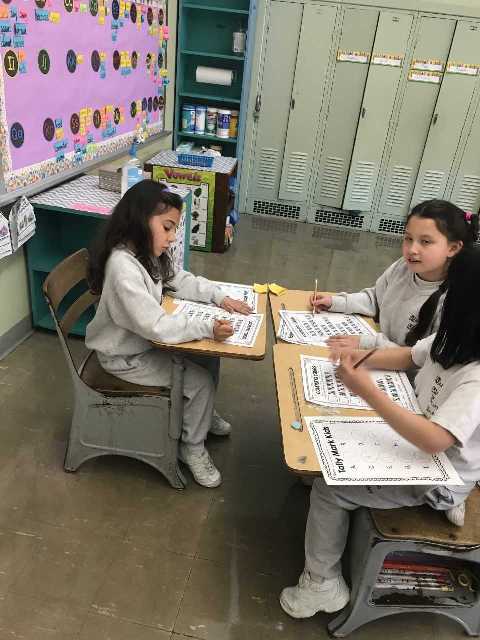 They have been working very hard in math as they practice showing numbers in more complex ways such as tens and ones, using different manipulatives to help them. In science, we have begun learning about states and properties (solids, liquids and gases). They can’t wait to get in to the makerspace to show these properties using everyday real objects! First grade has been very busy this September! Our class has been learning all about addition in math and we are beginning our narrative writing unit, in which students write to tell a story. First graders are becoming great readers as they read to partners or a small group. First grade is also continuing to practice their prayers and we are learning all about creation. We look forward to learning more about animals in science and to start conducting experiments!